One cue, six pockets, 16 balls and hours of great fun! Pool is a game that everyone knows. It consists mainly of hitting balls with a special cue. The whole game takes place on a massive table, which is covered with felt and has six pockets, in the corners and in the middle of the longest edge of the table. Pool tables are rectangular, with a ratio of 1:2. Unfortunately, even fans of the game are often not able to install a pool table in their house or apartment due to the fact that it requires a large amount of space. 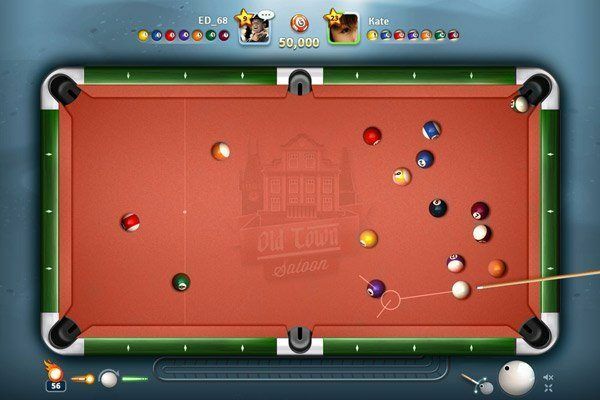 For all those who nonetheless want to play Pool 8 at home, we offer an excellent solution - pool 8 online. GameDesire is a platform that provides a variety of popular online games. One of them is pool 8, also called 8-ball. 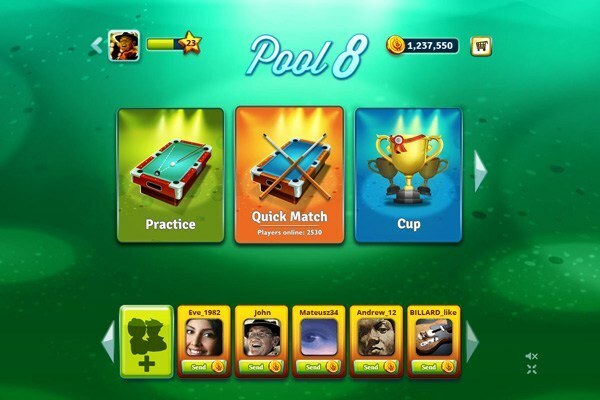 The great news for people who do not like to play online games against the computer is that the pool 8 game allows us to interact with a live opponent. For beginners, training is also provided. With gameplay warm-up, you can discover for yourself how to control impact, try rotating balls, and improve your breaks. 8-ball on Gamedesire offers eight game modes. Each one is different, above all in the number of chips that are at stake when we enter the game. The options are 250, 1 000, 2 500, 5 000, 10 000, 25 000, 50 000 and 100 000. The higher the stakes, the more excitement there is at the table. Moreover, slightly different rules apply to each game mode. It’s worth checking whether the game mode you select means you have to declare a pocket for the black ball, whether you have access to guides, and whether you can use tricks. In each game players are ranked. If you score the right amount of points for the matches played, this will allow you to advance to a higher level and compete with better players. The number of chips you hold in a pool 8 game is very important, as it allows you to play for higher stakes and gives you the chance to gradually increase your winnings. Want to win more tokens while experiencing unique emotions, beating opponents and climbing the levels through the rankings? If your answer is "yes", be sure to try the club competitions. To do this, instead of the standard option "Play Now" select "Cup". There are four categories of games for 250, 1 000, 2 500 and 5 000 chips. The higher the entry fee, the greater the pot for the victor. Eight players participate in the knockout format. Winning cup competition can increase the number of chips you hold very quickly. 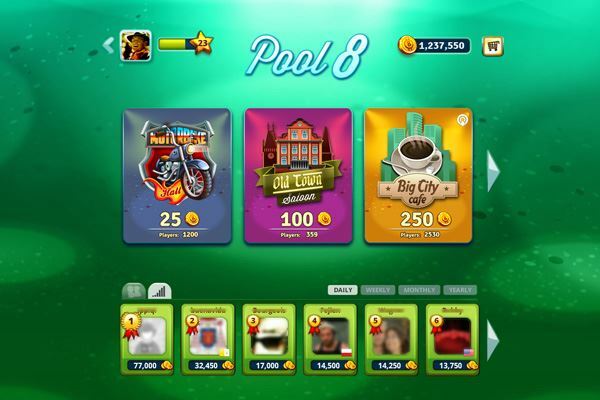 In pool 8 you can spice up the visual qualities of the game. Using chips or ducats, you can buy original pool cues, and change the appearance of the baize on the table – either the material or the design. You can also purchase tricks to multiply your chances of winning a game against opponents. Remember, however, that these abilities alone are not enough. It is equally important to choose the right kind of cue. For example, buying a better cue will allow you to reap the benefits of greater power, rotation or longer guides, improving accuracy. Winning through to the next level of experience will also increase the range of options available to you in the cue applications. GameDesire offers a refined game in every detail, with extremely realistic physics. It allows you to practice the game of pool, while having fun in competition, staking different numbers of chips against real opponents from all over the world. The tricks and impact skills you learn can also be used in a real pool club, winning the admiration of friends. 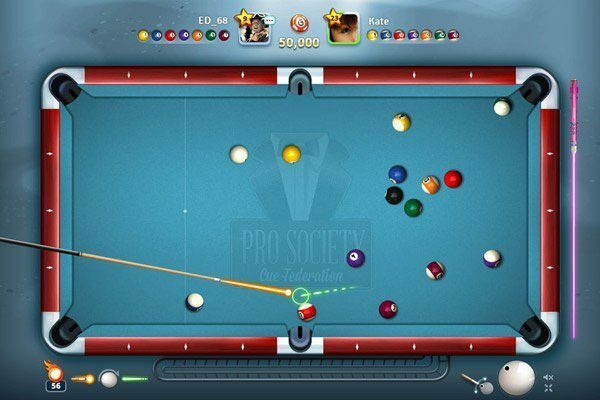 So if you are looking for great and endless fun, pool 8 is without doubt the perfect game for you. And 8-ball will give you many unforgettable moments.